With summer just around the corner, there is no limit to the kinds of adventures you and your pet can go on. However, increased activity levels can lead to an increased risk for injury. Many times, injuries sustained during playtime are minor and not a cause for concern. However, if your dog falls, runs into the street while playing fetch and gets into a traffic accident or experiences some other large trauma, checking for broken bones is necessary. 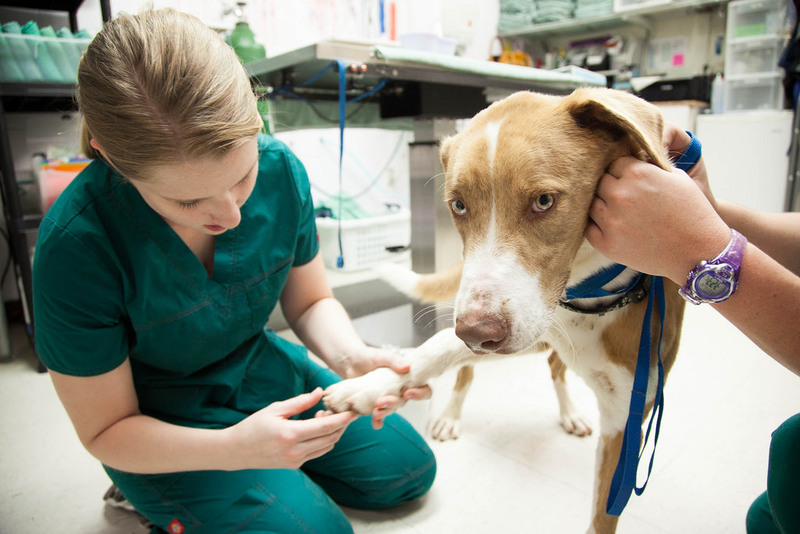 If it is determined your dog has a broken bone, seeking immediate veterinary assistance is crucial. Although this may seem obvious, indications of pain, including whining and limping, are two red flags that a larger problem is at play. Especially if your dog has just fallen or experienced some other blunt force to his body, do not ignore whining or limping as temporary symptoms that will go away with time. They could indicate a severe injury. Of course, if the bone is protruding from your pet’s skin, that is a clear indication the bone is broken. However, not all breaks cut through the skin, so it is important to take seriously the signs of pain your dog exhibits. An open fracture means the skin has torn, and the broken bone is visibly sticking out of your pup’s body. A closed fracture, on the other hand, is when the bone has still broken, but it has not punctured the skin. If the bone has a small sliver in it, but it is not completely severed, your dog will still need treatment. This type of break is known as a hairline fracture, and though not as severe as an open or closed fracture, it is still painful for your pooch and needs treatment. Use a muzzle. Some dogs may become disoriented and aggressive when they are in pain. In order to most effectively help your dog (and to keep you safe) PetMD recommends putting a muzzle on your pooch, as long as it does not obstruct his breathing. If necessary, use a stretcher. If a large portion of your dog’s body is affected, such as his back, strap your dog onto a stretcher or a wooden board / sturdy sheet of cardboard to try and limit his movement. Use gauze as needed. If your four-legged friend has an open wound that is bleeding, use gauze or a clean towel to place around the exposed bone to help keep it clean. Avoid using any antiseptic creams on the open wound. Try making a splint to help limit movement and keep your pet safe. You should never try to re-set your pet’s bone. However, while you are transporting him to the vet, it is perfectly acceptable to take a rolled up newspaper or magazine to put around the affected area to keep it as straight as possible. At all times, keep your dog warm to prevent shock. Your canine companion just suffered a trauma, and it is important to keep your pooch warm so his body avoids going into shock. Thanks for stopping by! If you enjoyed our article about broken bones in dogs, feel free to share it with friends, family and on social media sites.